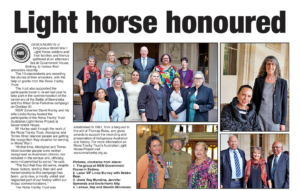 Descendants of Indigenous World War I Light Horse soldiers and their families and friends gathered at an afternoon tea at Government House, Sydney, to honour their ancestors recently. The 13 descendants are recording the stories of their ancestors, with the help of grants from the Rona Tranby Trust. The trust also supported the participants travel to Israel last year to take part in the commemoration of the centenary of the Battle of Beersheba and the Allied Sinai-Palestine campaign on October 31. NSW Governor David Hurley and his wife Linda Hurley hosted the participants of the Rona Tranby Trust Australian Light Horse Project at Government House. Mr Hurley said through the work of the Rona Tranby Trust, Aboriginal and Torres Strait Islander people are getting the recognition they deserve for serving in World War I. “At that time, Aboriginal and Torres Strait Islander people were neither recognised as Australian citizens, nor included in the census and, officially, were not permitted to serve,” he said.